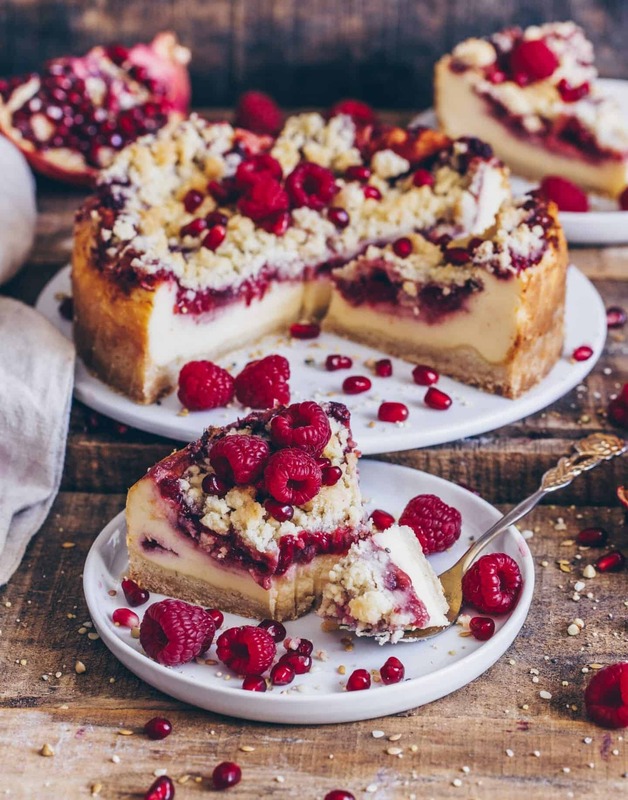 Due to the weekend, I have a super delicious vegan cheese crumble cake with a juicy layer of raspberries and red currants for you! 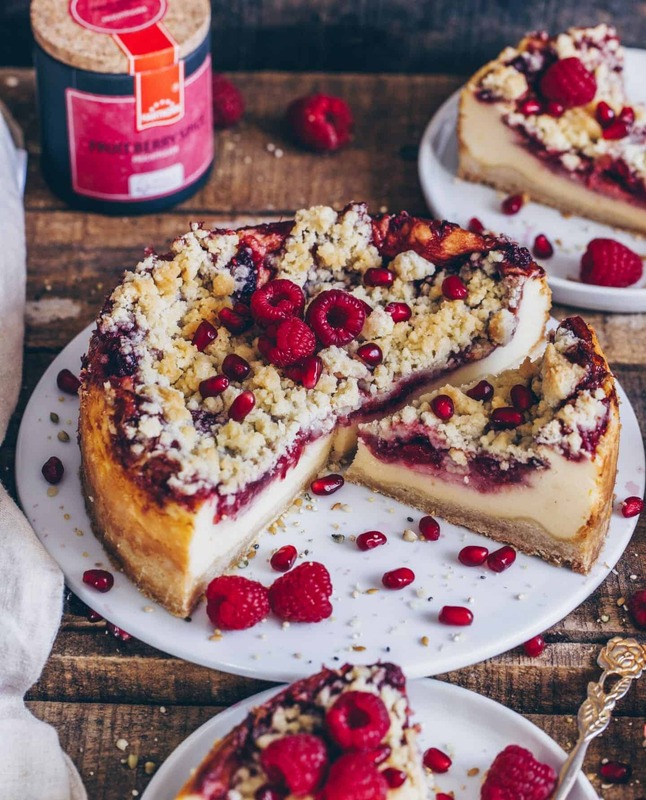 This recipe is really simple and unlike other vegan cheesecake recipes, this filling is without tofu and without nuts. To be honest, I‘ve always had a thing for cheese or quark cakes. They have always been and are still my absolute favorite cakes. But I guess you already knew. 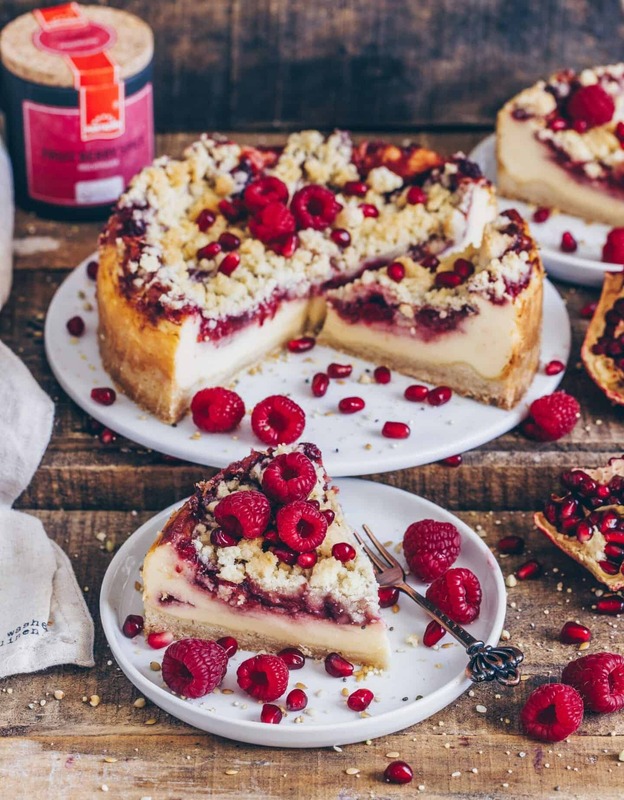 Even in my childhood there were the simple classic cheesecake made by my mother or the super fruity quark cakes with yummy crumbles made by my grandmother. Since I came across the vegan nutrition, I’ve also realized that you can make these delicious cakes even without dairy products and eggs. And because it’s so much fun to create vegan recipes, I’ve made it my mission to create such recipes and share them with you. 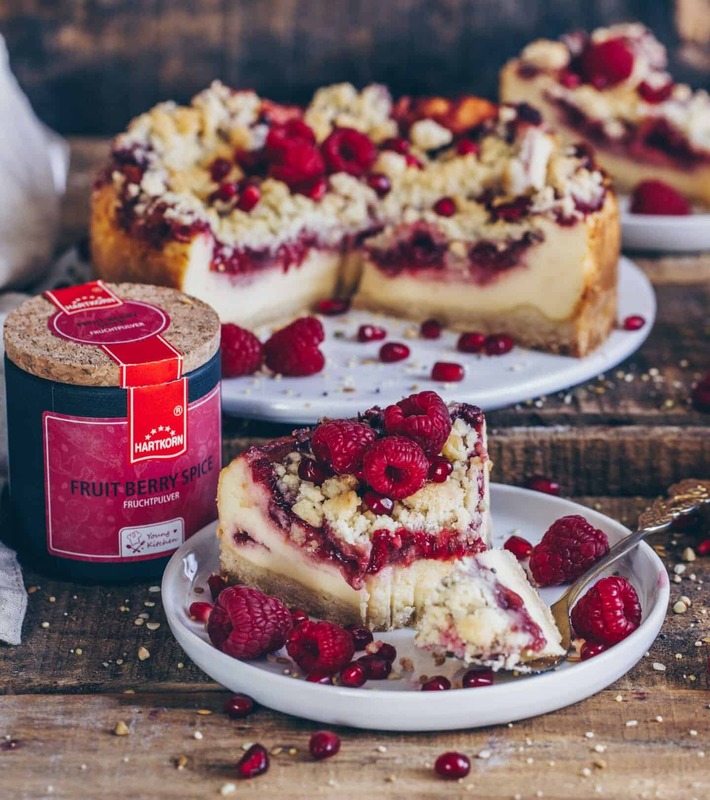 Thanks to today’s variety of dairy-free products in the supermarkets even vegan cheesecakes are possible and absolutely no problem! My first vegan cheesecakes were with a no-bake cheesecake layer. For my ‘cheesecake cake with chocolate base and blueberries‘ I used plantbased almond cream cheese and for the ‘raspberry-vanilla cheesecake‘ I used soy quark and soy cream. I was really surprised how delicious these cakes were. For my baked ‘Blueberry Cheesecake with Almond Brittle‘ I used tofu. But I also like it very much and if you choose a tofu type that has only a little soy taste, you won’t realize the tofu taste. This time I experimented with soy quark (it’s from Alpro GoOn) and berries. Especially red berries are currently my favorites! And to make it even more berrylicious, I have included in this recipe the ‘Fruit Berry Spice‘, which is a pure berry fruit powder. Since berries are so rich in vitamins and antioxidants, it‘s even a real vitamin bomb and definitely ensures summer feelings even on gray and cold days! If you can‘t find or don’t want to buy soy quark in the supermarket, you can easily make it yourself by simply dripping soy yoghurt for about 12 hours in a strainer lined with a cotton cloth. To make 250gr soy quark you’ll need about 350gr- 400gr soy yoghurt. This recipe is really super easy and you don‘t need any extraordinary ingredients. You can also simply use red currant nectar or other fruit nectar for the berry sauce. And the cake tastes really delicious! 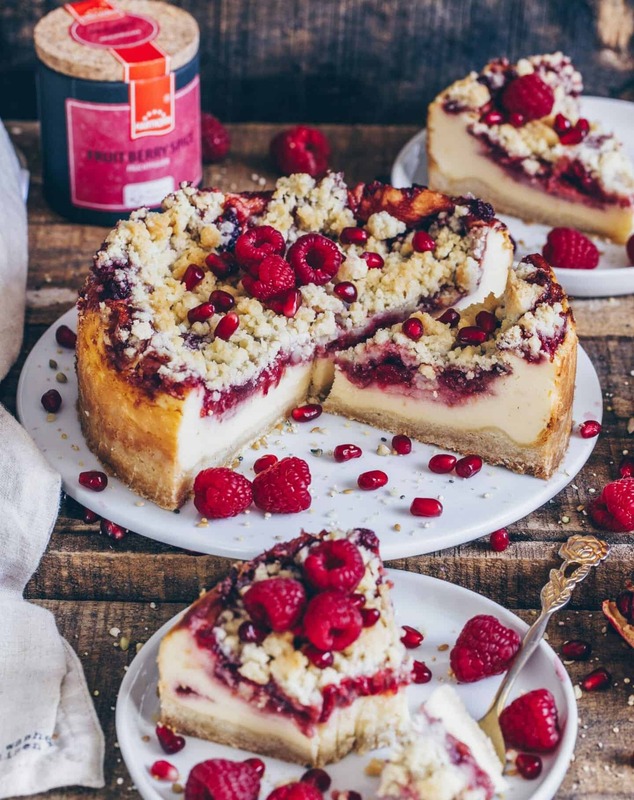 The consistency of the quark filling is quite similar to a traditional cheesecake which is made of quark. I think this cake is perfect for a birthday or just for a cozy afternoon. I used a small 18 cm springform for this recipe. But if you want to bake a regular sized cake (26 cm), you can easily double the recipe. I have linked various bakeware here ?? ‘kitchenware‘. In addition, I recommend that you should longer the baking time in this case. It’s best to make a test with a skewer in the middle of the cake. As soon as only a little bit of the dough sticks to the skewer, the cake is done. If you tried the recipe, I would appreciate a comment. You‘re also welcome to post a picture on Instagram and link it to @biancazapatka, so that I can see your post and leave a comment. ? For the crust, first melt butter in a saucepan and allow to cool slightly. Combine flour, sugar (or syrup), vanilla and a pinch of salt in a bowl. Add the melted butter and knead everything with the dough hooks of your hand mixer to crumbles. Now press about 2/3 of the crumble mixture as a cake crust into a greased 18cm springform. 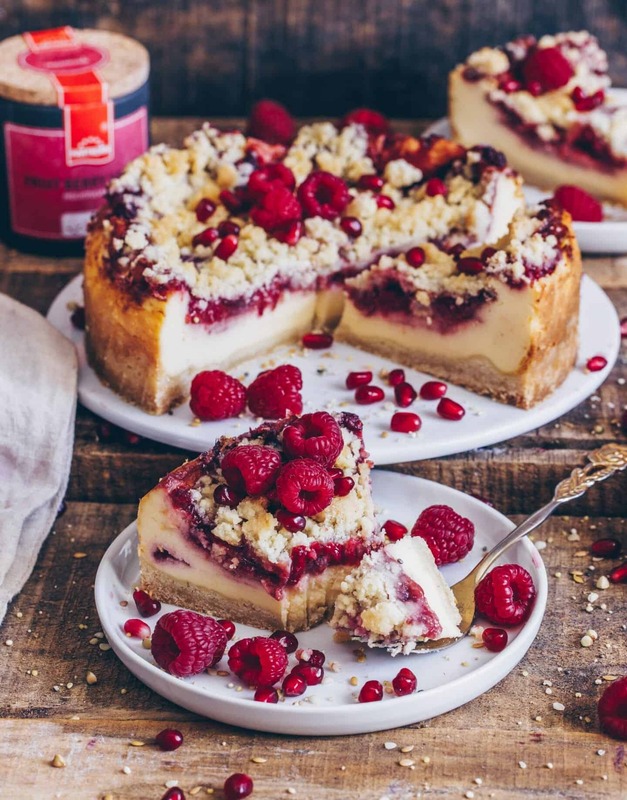 For the cheesecake filling, simply stir all ingredients until creamy and spread on the crust. For the raspberry layer, wash the raspberries first. Then stir the cornstarch and 2-3 tbsp of nectar until smooth. Pour the remaining nectar and 1-2 tbsp sugar or syrup (to taste) into a saucepan and bring to a boil. Add the dissolved starch, bring to a boil again while stirring and simmer for about 1 minute. Stir about 3/4 of the raspberries under the nectar and allow to cool for about 10 minutes afterwards. In the meantime, preheat the oven to 175°C upper/ lower heat. Spread the raspberry compote on the quark mixture, smooth it and allow it to cool. Finally, spread the remaining dough from the base as crumbles on top of the cake. Then bake the cake for about 60 minutes (cover with aluminum foil in the last minutes, if the cake gets too brown). Allow to cool for approx. 4 hours after baking. 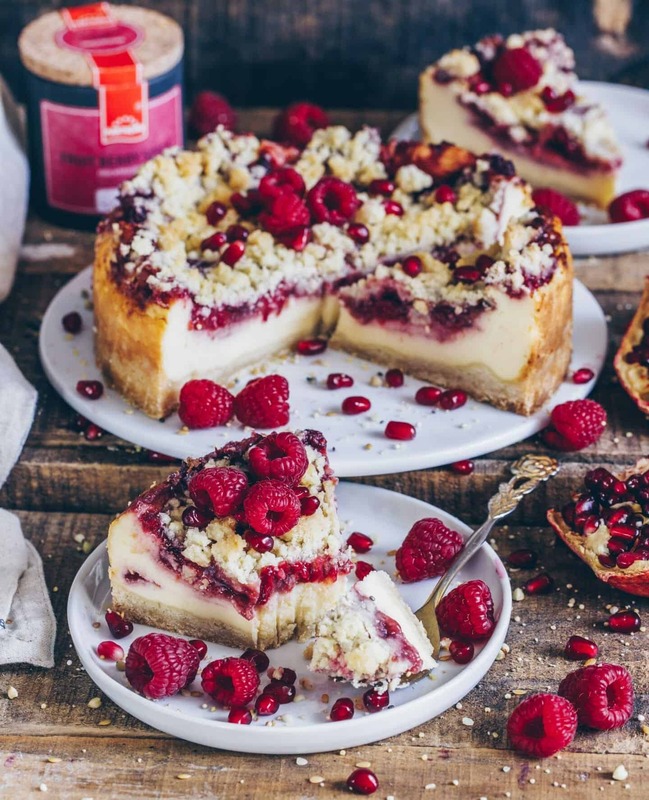 Decorate with pomegranate and berries before serving, if you like. What a stunning creation Bianca! 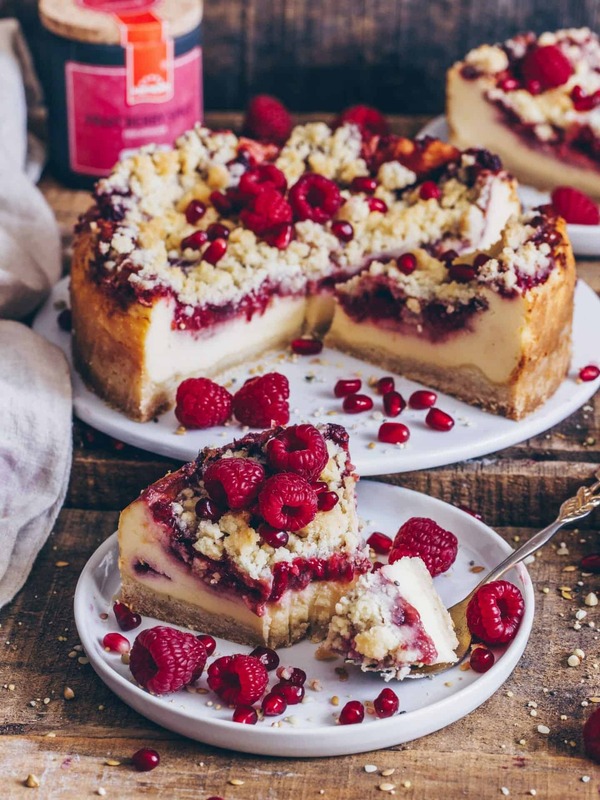 I would love a slice of this magnificent cheesecake! Thanks for your comment ? Hello. Since I do not use either sugar, flour or soy products, I suppose I can use coconut yogurt for the quark, raw honey for the sweetener and almond flour for the crust. I’ll try it as I love berries, too! I’ve never tried this combo but it sounds good to me ??? Would love to read your feedback after trying the recipe with your options. Hi! Can’t wait to try this recipe. Just confused on what day to grease form is? After I hear back I’ll be able to make it and let you know how it goes! I used vegan butter but you can also use coconut oil or other oil of choice ? I think this cake tastes always good, not only on easter ? Would love to read your feedback after trying the recipe? This recipe looks really delicious! I would like to give this a try. I can’t find the soy products and I don’t need it to be vegan. Can I replace the soy quark and soy cream with regular quark and heavy cream? Sure you can also use dairy products if you like! This also works perfectly ??? Sure, you can sub a gluten-free flour blend. Although I love your page I am not vegan and neither is my partner. So I try and change your recipes to vegetarian when I can. Yet when it comes to backing. I am a bit skeptical as it isn’t as easy. For example can I use cream cheese in this cake! Thanks you and enjoy Spain as much as you Can. I’m in Kohannesburg SAfrica and I wish I could start a two bed B@B anywhere. Being without a job here for 10 months is killing us..
What is the alpro soya quark? I’ve not seen it in the shops, would you mind sharing a link to it? I‘m not sure if this product is available where you live. Maybe you could find another brand that sells soy quark, for example „Provamel“?